SFx Ultimate Polarised Lens is one of the strongest, lightweight and durable lenses made. 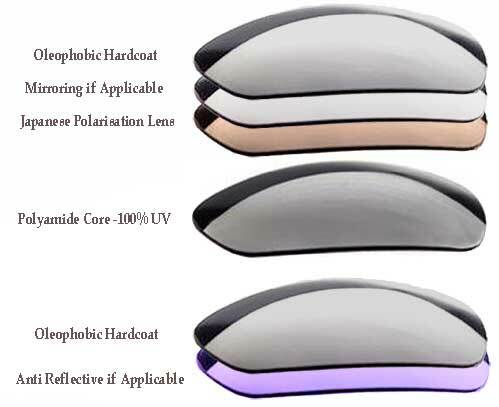 These lenses integrate a Japanese polarisation film with 99.9% efficacy rating making it one of the best glare fighters around. Many of our customers say this is the best lens they've ever owned. and they had gone out of production. The SFx lenses are better than the original lenses and eight months on, they remain in perfect condition." They Perform: All our lenses are crafted from optically superb polymide or polycarbonate material and are coated to give glass like optical clarity. Our SFx lenses are 60% lighter than glass and are much stronger. All our SFx polarised lenses and silver mirrored lenses have a Super Hydrophobic coating that makes cleaning and repelling water during strenuous activities a breeze. They stay clear so you can perform and provide the best optical comfort in the harsh Australian UV conditions. Safety: The SFx lenses are made from the same primary material used in bulletproof glass and safety goggles making the lenses virtually shatter proof. They rank in the top percentile for safety. With 100% UVA, UVB, and UVC you know these lenses will protect you in even the harshest environments. Durability: All our lenses have undergone industry standard steel wool abrasion testing and rank between 600-800% higher than competitors retailing for well over $200 in the shops. While polycarbonate lenses still lag behind glass lenses in scratch protection, they do not break and will last for years if taken care of. Value for our customers and the Environment: We strive to offer the best products at a fair price in the most convenient manner. This allows our customers to get new lenses while saving money and helping the environment. With over a billion pairs of sunglasses being sold every year, it's time to change the way we live and reuse perfectly good sunglass frames. Reuse and recycle! Colours and Choices: Get the lenses you want, not the ones that came with your sunglasses. We can fit most sunglasses with a choice of 10 different lenses. Try our SFx Ultimate Polarized and find out why our customers rave about these lenses.